Parks and Rec’s Mike Schur on his love of funny names. What makes a funny name a funny name. Illustration by Derreck Johnson. Images by tonioyumui/iStock; Sudowoodo/iStock and Anar Babayev/iStock. 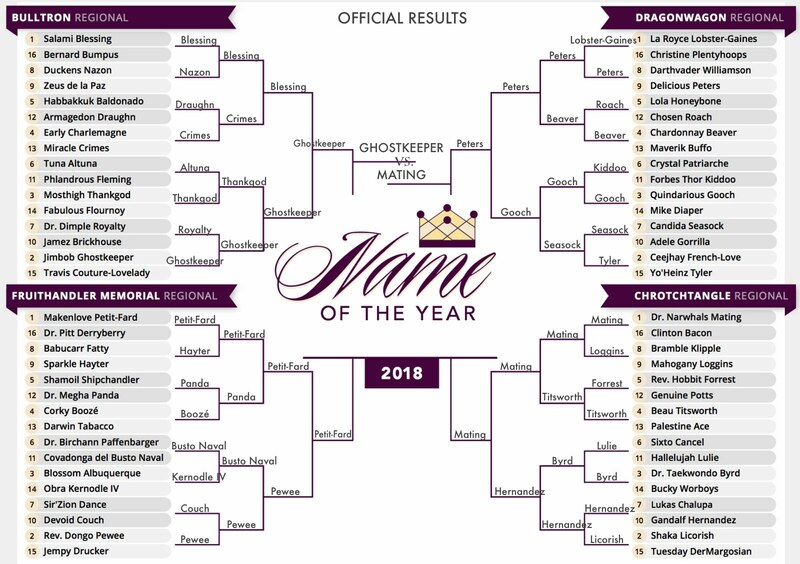 The 2018 Name of the Year championship match is set, with Jimbob Ghostkeeper taking on Dr. Narwhals Mating for the crown. (You can vote for your favorite here.) Earlier this month, in the Slate Plus segment of the sports podcast Hang Up and Listen, hosts Josh Levin and Stefan Fatsis—who also happens to be one of Name of the Year’s founders—were joined by Mike Schur, the creator of Parks and Recreation and The Good Place, to talk about this year’s contestants and what makes a funny name a funny name. An edited transcript of their conversation—which took place before the Name of the Year finalists had been, well, named—follows, and you can listen to the full audio version by clicking on the player below. Members of Slate Plus get bonus podcast segments like this one every week. To get access to these extra segments and other members-only perks, sign up for Slate Plus today. Stefan Fatsis: I would be remiss if I didn’t ask you about this year’s Name of the Year tournament. I don’t know if you’ve looked at the bracket. Mike Schur: I haven’t checked in days and days and days. Where are we right now? Fatsis: We’re at the Sweet 16 now. Things are looking good. The top seeds are all still alive. Oh, I take that back. La Royce Lobster-Gaines was ousted by Delicious Peters. Josh Levin: Delicious “UMBC” Peters. Fatsis: In the second round. Levin: Oh, it was in the second round—not a 1–16 upset. Fatsis: There’s also Salami Blessing, Makenlove Petit-Fard, Dr. Narwhals Mating … those are the three No. 1 seeds who are still alive. Levin: Do you have a funny name theory, Mike? What makes for a funny name? My whole life, I’ve been obsessed with funny names, and so when I discovered the Name of the Year bracket, I mean, it’s like it was made specifically for me. Fatsis: I think actually in the 1980s, when my buddies and I decided to make the Name of the Year competition, we were thinking of you, Mike. We knew you would come along. Schur: You were thinking of an 8-year-old in suburban Connecticut, yeah. I tweet this every year: It’s the best day of the year. When the bracket comes out, it’s my favorite day of the year. It’s just—it’s wonderful. I’ve thought about in the past making my own bracket to send to you that is the 64 craziest names that ever appeared on TV shows that I’ve worked on. Maybe I’ll do that. Fatsis: That would be awesome. Schur: There was a woman we named Judy, and then I didn’t know what to name her last name, and I was tired, so … someone was talking about a pair of shoes they had ordered from Zappos, so I was like, “Alright, her name is Judy Zappos.” Then I thought, “Well, I can’t name her Judy Zappos because I might get sued or something, it’s a brand name.” So I wrote out Zappos backwards and appended it to the end of Zappos so her name is Judy Zappossoppaz. And then I liked that so much that I took that entire thing and appended it to the end of her name again, so her official character in the show is Judy Zappossoppaz-zappossopaz. I believe she was a waitress at a bar who came over and said, “Can I get you anything to drink?” That was the sum total of Judy’s contributions. Schur: It’s Hfuhruhurr, and there’s a running joke in the movie where people keep mispronouncing it. Schur: And the woman he falls in love with, her last name is Uumellmahaye. And that’s part of the reason that they fall in love, is because they both have last names that are very hard to pronounce. Schur: I would like to say that Roger Ebert is an incredible critic and a brilliant writer and contributed amazing things to the community of arts and letters and he could not be more wrong. That is a terrible take from Roger Ebert. Fatsis: And I will concur, as a nonprofessional Hollywood writer, with the professional Hollywood writer. Schur: Take that, Roger Ebert. Stefan Fatsis is a panelist on Hang Up and Listen and the author of Word Freak and A Few Seconds of Panic.